although i’m still not a big fan of it (yet? ), i’ve been trying to work my way through the castlevania series. next up for me was castlevania: harmony of dissonance on GBA. 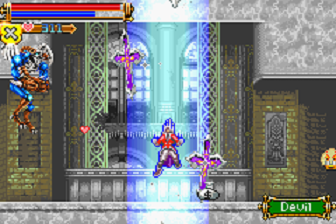 it seems that the game is the least liked of the three castlevania games on GBA, and i agree with the general consensus that the game, although it looks more polished (albeit a bit garish) than circle of the moon, is too easy and that the dual-castle mechanic isn’t that interesting. the game was fairly mindless and rote for me and ended up requiring a ton of backtracking, although i got to like it more by the end. there are some nice details in the enemy design that i don’t recall seeing in the other titles (like the skeletons that jump out of mirrors and the special events you trigger by destroying guardian armors in often amusingly gruesome ways), and the weapon combination system helps make things more interesting (although i mostly stuck to the holy book shield variations). the bosses tended to feel very same-y, though, partly due to all appearing in similarly shaped rooms, long with a low ceiling and two ledges. overall, i would rank this below circle of the moon, which although much more frustrating was also more difficult and thus less mindless. neither of them ended up being particular favorites of mine, although it looks like the next entry, aria of sorrow, features a more-memorable central game mechanic. lone gamer that i am i haven’t really spent much time with the mario party series, but a friend of mine lent me the somewhat awkwardly named mario party-e. mario party-e is a novelty hybrid that combines a physical board/card game with mini games played by scanning cards into the e-reader. this was my first experience with the e-reader, and that in itself was novel and entertaining (if not a particularly efficient way to get your gaming fix). i didn’t actually play through an entire game, but just from a mock playthrough the game seems to be fairly decently balanced. as seems to be the case with mario party games (and nintendo multiplayer in general, cf. the mario kart series) chance plays a fairly big role and it looks like it wouldn’t be uncommon for the person in the lead to end up moving to last place in just one turn. 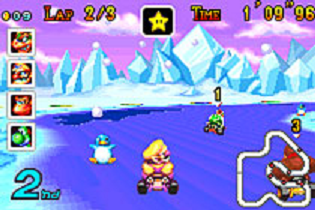 but the mini games are entertaining if not particularly unique; they’re helped in part by the novelty of seeing daisy and waluigi in their own mini-game starring roles. this was another quick diversion. not worth a huge monetary investment, but as it doesn’t seem to be particularly rare it’s a more-or-less worthwhile addition to the meager library of the little-used e-reader peripheral. earlier this summer i finally finished playing through kirby tilt ‘n’ tumble, a late GBC game and nintendo’s earliest foray into motion-controlled gaming, thanks to its built-in accelerometer. nintendo waited until the end of the GBA’s life span to release its second accelerometer-based game, warioware: twisted!, which i thoroughly enjoyed. 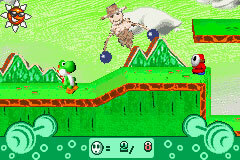 this was almost immediately followed by the similarly controlled yoshi topsy-turvy, also for GBA. (incidentally, for all those trivia buffs out there, in the US that game was actually released after its DS cousin, yoshi touch & go, and the very same thing had happened to warioware touched! which was released on DS before twisted!.) also, topsy-turvy has the additional advantage of supporting the original orientation of the GBA (cartridge is oriented the same way as the console), as well as the orientation of the GBA SP and DS (cartridge is upside down). topsy-turvy, being a platformer, is more similar to tilt ‘n’ tumble than twisted, although the gameplay is very distinct. whereas in tilt ‘n’ tumble you guide the pink puffball through pinball-like stages, topsy-turvy plays like a more traditional platformer and you use the tilting mechanism to activate environmental objects, such as making platforms extend or boulders roll. the pacing is more enjoyable than tilt ‘n’ tumble and tilting to affect the environment doesn’t usually bring the action to a grinding halt the way that it did in that game. also, being able to play on my GBA SP did help keep the motion sickness to manageable levels. the uniqueness of topsy-turvy isn’t just the controls, however. as with yoshi’s story the game has a surprising structure (not to mention a similar storybook aesthetic). the game includes six worlds, but the number of levels in each world increases from the first world’s three to the final world’s twelve. 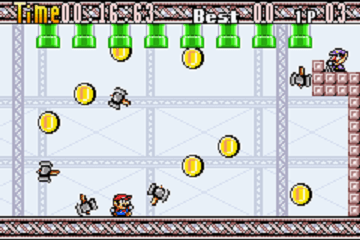 although you’re required to finish every stage, each stage comes with a mission: eat a certain number of fruits, collect a certain number of coins, get to the exit within a certain time, defeat a certain number of enemies, don’t defeat more than four enemies, and avoid getting damaged by the auto-scrolling screen. at times two missions are combined, and the game taxes you with successfully completing the missions (which earns you medals) for a certain fraction of the stages within the world before you can progress to the next. this focus on missions is unusual for a platformer, and although i never really actually enjoyed that structure i appreciated its pacing: each mission type is introduced one at a time, one for each new world (each world includes the previous mission types as well). the game doesn’t particularly impress when judged as a platformer, though. the graphics are excellent and rival those on the DS, but aside from the motion controls the level design is fairly ho-hum and none of the stages really offer much in the way of a “wow” factor. the game does incorporate some transformations (yoshi transformations were last seen in super mario world 2, but the ones here are completely new) but most of them are more frustrating than fun. the game’s also a bit on the short side (which was fine by me since it wasn’t really keeping my attention) and only includes one real boss battle, although trying to earn gold medals by completing a mission perfectly could extend your game time, at the expense of your sanity. all in all this was a game that was an interesting entry in nintendo and video game history, but not that much fun. overall i’ve enjoyed the yoshi series more than the kirby series, though, and am looking forward to playing more of the remaining two, both for DS. even though i’d just finished castlevania: SOTN i was interested in what the post SOTN castlevania games were like so i tried out its immediate successor circle of the moon. 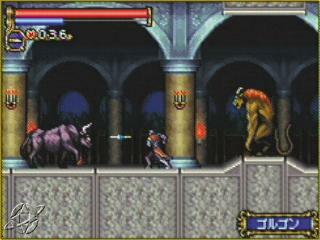 the game is the first of three castlevania games on the GBA, and was one of the few that SOTN producer koji igarashi was not involved with. having only played SOTN of the “modern” castlevania games i don’t have the larger context, but the game does have noticeably less detail and visual polish than SOTN, even taking into account the limitations of the platform. the game is also much more difficult, which was both refreshing and frustrating. since the gameplay itself is pretty much identical to SOTN, the increased difficulty made combat more interesting in general. there’s a ton of reused palette-swapped sprites, but as with TWEWY in general their behaviors make them distinct and worthwhile. the game’s pacing is really unrefined, though, and there’s a ton of backtracking and save points never seem to be where you need them to be. the middle section was also extremely frustrating and i only found out after i’d beaten the game that this was because i had done one section out of order (the poisonous sewers; apparently i’m not the only one who’s made this mistake). also, the magic system, in which you combine two cards, feels unique but underutilized, and it really, really bugs me that you can only obtain certain cards in a completely obscure way (e.g. fighting an enemy who only appears in one location and only has a small chance of dropping the card). all in all, even though there was a lot i disliked about the game, there wasn’t a lot that i absolutely hated. as a continuation of the castlevania series there was just enough that was new to keep me interested, and the new modes that are unlocked on subsequent playthroughs look interesting. subsequent entries will definitely have to shake things up significantly more to draw me in, though. harmony of dissonance already feels like a huge snoozefest from the first half hour i’ve played of it, but since i’ve finished the metroid series i’ll probably end up working my way through more of the castlevania series before too long. – nice section on the game at castlevaniadungeon.net. includes a handy chart of all the card combinations and a bestiary with sprites of all the enemies and their item drops. 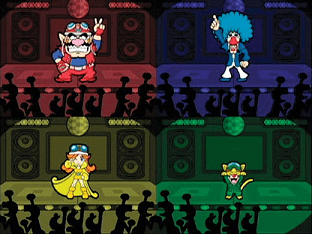 i’ve developed into quite a fan of the warioware series, and despite having no video game buddies i decided to go back and give wario ware, inc.: mega party game$! a quick run-through. the game is a bit odd in that it’s an expansion of the original warioware game for GBA (my review of that game is here) with a focus on multiplayer rather than a true sequel. the single-player mode is somewhat tedious since you have to play through every character’s games (usually 25) to progress rather than a subset as in the original. this mode doesn’t feature the fun cartoon intros and unlockable toys and games of the original either, or any new microgames, so it’s all pretty barebones. still, it was nice to revisit all the microgames, although playing through all of them did highlight the ones that are anomalously difficult and/or obtuse. there are a couple of new unlockables in the form of a “master” (i.e. marathon) mode in which you play through all 204 of the microgames (it doesn’t include the 9 boss battles) and see how many you can get, and two random minimalistic music videos (which can be seen here and here, lyrics at the bottom of this page). the most worthwhile single-player addition is a time attack mode where you try to complete 20, 40, or 60 microgames in the least amount of time (for every one you win the speed goes up and for every one you lose the speed goes down). despite not having anyone to play with i also sampled all the multiplayer options. they’re pretty much all variations of “who can win the most microgames”, but there’s an entertaining 1-controller survival mode featuring a rainbow of tingle-esque suited characters, and an othello-based board game that requires a bit of strategy beyond just winning microgames. the entry at mariowiki.com has a good run-down of all the modes. not having been able to play much of the multiplayer games leaves me not being too qualified to comment any further, but at some point i may come back to this. i’m not quite sure how much “pick up and play” gameplay this offers, however, since people who have played through the original or the single-player mode will be at a distinct advantage, but it was fun to see the games on the big screen and it’s whetted my appetite for the handful of warioware games left that i haven’t played yet. – the entry at mariowiki.com for the original GBA game has listings for every microgame. is it just me or does this guy look like jeff buckley?? when i had first played the game i had just finished playing all four (up to then) US-released fire emblem games and one of the japan-only titles, so i was a bit disappointed in AW‘s lack of plot and the focus on battle tactics over levelling up a set of characters. coming back to this after having played the rest of the AW series was a pleasurable rush of familiarity and appreciation for how perfect this game truly is. the characters are lovable and their CO powers distinguish them well; the battle mechanics are absolutely top notch; the graphics and music are excellent; and there’s an enormous number of maps with a fully satisfying level of variety among them. although i adore dual strike and in many ways consider it to be the pinnacle of the series (well, the US series at least, as i haven’t yet dipped into the japan-only titles), the original makes a strong case for not injecting the core game with steroids and in some ways overloading the game with a glut of extra features. a lot to love, so it seems churlish to have any complaints. this time through i did an S-rank run of the normal campaign mode, and chose my route in order to unlock the rest of the COs. it didn’t end up being too difficult, although i chose sami the whole way through and her missions are probably harder than andy’s or max’s. i also S-ranked the first war room maps and tried out the hard campaign mode, and here’s where things started to get dicey. 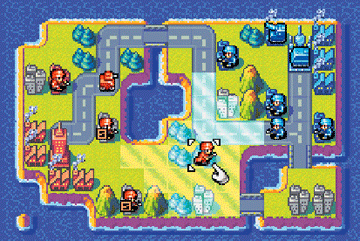 a large part of the reason i like the fire emblem and advance wars series is that, unlike a game like chess, the emphasis isn’t on planning far ahead and instead a general strategy will suffice. but when trying to S-rank maps and in what i’ve experienced so far of the hard campaign this isn’t always the case, and although i enjoyed the “puzzle” aspect of some of the maps, at times it feels like there’s too much “try and die” gameplay. the game feels less cheap overall than other games with more-egregious cases of such gameplay, because as this article at edge puts it: “It’s not so much trial and error as trial and education, each mistake teaching you a little more about the impeccable clockwork that powers the game’s simple, stunning mechanics.” although oftentimes the lessons learned from a particular map do feel like they’d be applicable to others, the amount of memorization that can get to be involved and working out the timing of where your units can be on what day compared to the enemy’s can really make the game feel like a chore. also, although in the war room you can choose from all the available COs, because of the strict speed requirements if you’re trying to S-rank you more often than not have to rely on sami or max, which makes that section of the game feel more repetitive than it could have if it had had more varied objectives and conditions (as another example, sonja is completely useless in this mode since none of these maps feature fog of war). the fact that the war room maps also don’t include any pre-deployed units also make them feel too same-y.